Sensors connected via Bluetooth to a smartphone app can provide users frequent reports on their foot's temperature. 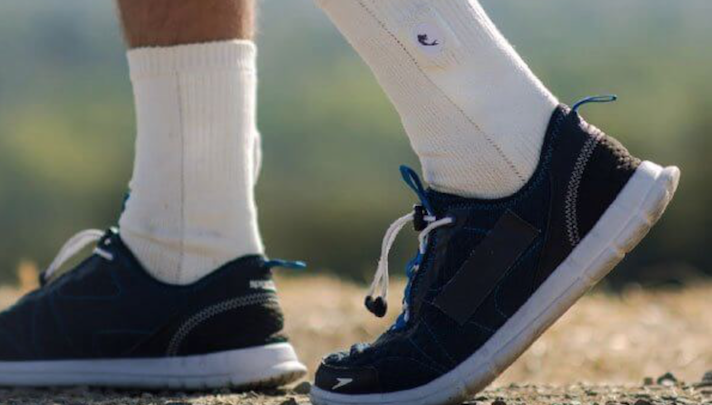 A pair of washable and reuseable socks with a special sensor could be key to continuously monitoring foot temperature in patients with diabetic neuropathy, according to a study in JMIR sponsored by Siren, maker of the socks. Researchers found that the socks were able to report temperature within 0.2 degrees Celcius of the reference standard, and that patients found the technology useable. At the end of the study, patients were given a survey about their opinions on the socks. Overall, patients reported the socks to be helpful and easy to use. Using a one-to-five-point scale, patients were asked how likely they were use the socks on a daily basis, to which the median score was four. The median score was a four out of five when patients were asked if the app gave them useful information about their feet, and if the app was easy to use. As for the sensors, researchers found that they were able to report temperature within 0.2 degree Celcius of the reference standard. “The temperature studies presented here show that the sensors used in the socks are reliable and accurate at detecting temperature,” researchers wrote. Participants were given smart socks, which are made of microsensors-laden textiles. These sensors were designed to take temperature measurements at 10-second intervals. The sensors took the foot temperature at the hallux, mid-foot and heel. According to the study, all of the data could be sent via Bluetooth to a phone app that could display the temperature. The study included a total of 35 participants with diabetic peripheral neuropathy (DPN) who were over the age of 18. Researchers categorized yhese patients into three groups: the first had DPN but no history of ulcers, the second had DPN and a history of ulcers and the last group had DPN and currently had ulcers. After going in for a physical exam, where a podiatrist examined each person's food and took photography of the foot, patients were given a pair of socks and told to wear them for six hours a day for seven days. Patients were given a feedback questionnaire on different aspects of the socks including design, fitness and usability. The sensors were tested differently. Researchers tested “36 stand-alone sensors in a high-precision thermostatic water for 10 seconds in 10 seconds at four temperatures” for a reference standard. The sensors that were embedded in the socks were then similarly tested in the thermostatic water bath for ten seconds. Researchers examined and compared the temperatures of these two tests, and also noted the range of temperatures the socks could measure. Diabetic foot ulcers impact 25 percent of individuals with diabetes, according to a 2005 study. The condition can lead to sepsis and in some case amputation. Researchers also noted the financial impact of condition, which can lead to emergency room visits and surgical amputations. Researchers have alluded to the socks being a way to catch certain conditions before it becomes too late. “Combined with a mobile app, this wearable device informs the wearer about temperature increases in one foot relative to the other, to facilitate early detection of ulcers and timely intervention,” the authors of the study wrote.